(VIDEOS) HM Queen Letizia of Spain Participates in a Symposium in Rome, Italy. On Friday, December 2, 2016, Her Majesty Queen Letizia of Spain arrived at the FAO Headquarters in Rome, Italy, to participate in the Simposio Internacional Sistemas Alimentarios Sostenibles en favor de unas Dietas Saludables y de la Mejora de la Nutrición (International Symposium on Sustainable Food Systems for Healthy Diets and Improved Nutrition). “…policies and program options for shaping the food systems in ways that deliver foods for a healthy diet, focusing on concrete country experiences and challenges. The target audience includes government officials with policy-making and program-design mandates from Agriculture, Nutrition, Health and other relevant sectors, as well as parliamentarians and non-state actors from civil society, private sector and research/academic institutions. (VIDEOS) TMs King Felipe VI and Queen Letizia of Spain Visit Portugal. On the morning of Monday, November 28, 2016, Their Majesties King Felipe VI and Queen Letizia of Spain began their three-day state visit to Portugal. The state visit began in the lovely city of Porto were Their Majesties were warmly welcomed by the President of Portugal, Mr. Marcelo Rebelo de Sousa, and other government officials. Please click the links below to watch a videos as well as to view photos. (VIDEO) TMs King Felipe VI and Queen Letizia of Spain Visit the Instituto Cervantes in New York City. On the evening of Monday, September 19, 2016, Their Majesties King Felipe VI and Queen Letizia of Spain visited the headquarters of the Instituto Cervantes in New York City, New York. During last evening’s reception Their Majesties met with “…Spanish professionals and students studying in New York City…” according to the news agency, EFE. 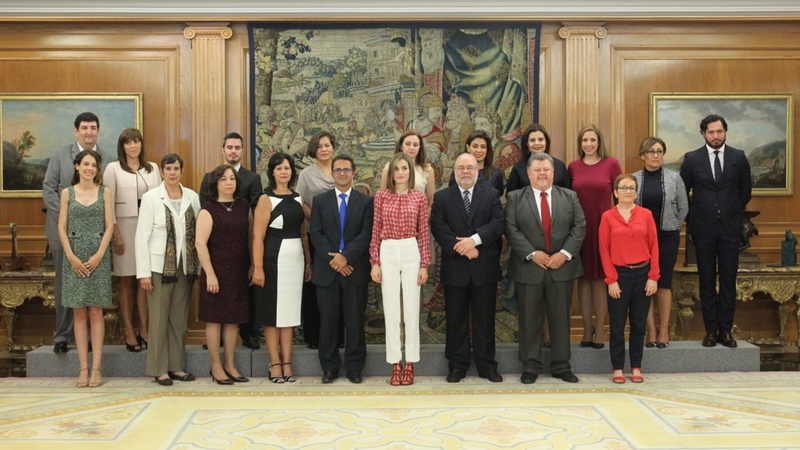 (VIDEOS) TMs King Felipe VI and Queen Letizia of Spain Met with Members of the Spanish Olympic Team. On Friday, July 29, 2016, Their Majesties King Felipe VI and Queen Letizia of Spain met with members of the Spanish Olympic Team participating in the upcoming Olympic Games in Rio de Janeiro, Brazil.